Tuna Sandwiches again ? Yup I made this for our breakfast before going to Church this morning. Simple and yet delicious. 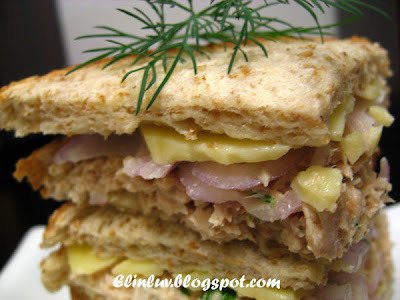 Imagine munching on this healthy tuna sandwiches with a cup of hot lemon tea while reading the morning paper....whoa....this is a simple and relaxing breakfast indulgence :)) Eating at home beats waiting for a table at the coffee shops on weekends :) especially those dim sum restaurants in town. 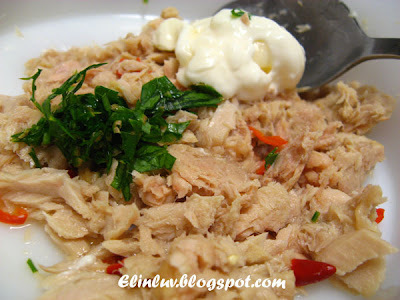 Mix the tuna flakes with ingredients A till well mixed. 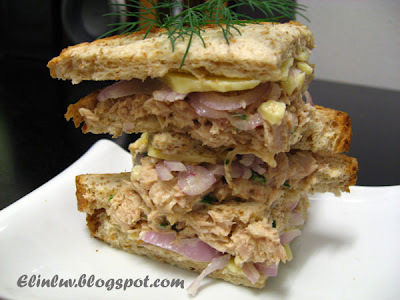 Spread evenly over a slice of wholemeal bread, topped with the pickled onion rings and cheddar cheese. Cover with another slice of wholemeal bread. Cut diagonally across into 4 triangles. Serve with a cup of hot lemon tea or coffee. Wow, giant sandwhich! 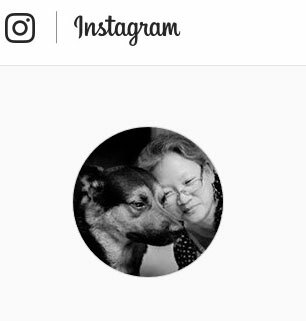 How come your pictures are so sharp and attractive? wow....can go into the mouth ar?? stack so high!!! Wow that is some tuna sandwich. Its more like a tuna tower. 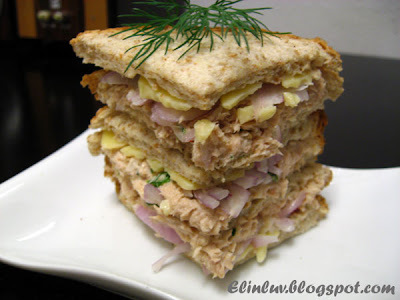 I love tuna and you cant go wrong with it in sandwiches. 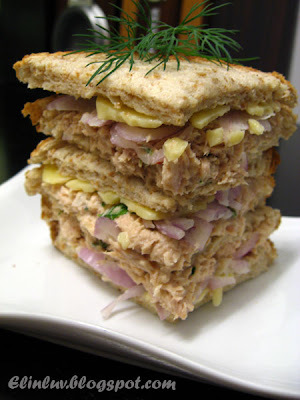 I can finish this triple decker sandwich by myself, coz it looks so delicious! Ermm.. very appetizing! Sandwiches, my all time favorite lunch! Quite a healthy version here you've got! wow.. you make a simple item look fabulous.. thks for feeding us ideas. heard so much abt you from claire..
Hi Cheah....haha still got room for improvement. Wow, that's a really huge sandwich. but it looks so yummy though. mm.